moms on DL - A mummy's inane blabberings.. Reminder to self. Don't talk too much to a journalist. Even though she's a colleague. I think I have a tendency to rattle on non-stop and talk abt inane stuff, not unlike how I write my blog entries. And my colleagues actually asked me why I'd given them such an ugly pic of myself. Have to agree. I look like a ghost on newsprint! But heh, I actually don't mind because at least I don't look fat. When I showed Aidan his pic, his comment was "Oh, it's me again! And with Mommy!" I think he's getting used to seeing himself in the papers. Uh-oh! 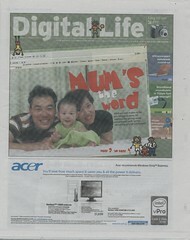 The editorial piece on mommy bloggers was scheduled for this week because it's the Mother's Day week. I think it came out quite positive. Serene from DL called me last Tuesday, the day before I was to leave for Redang so I did a phone interview with her. I'd passed to Serene four other moms' contacts to interview but she'd only contacted 3 of them [i'm sure you know by now who they are :)]. I thought the pic of Joan,Terence and li' Clare taken by the ST photographer was really nice! And I like the quote by Adele about being able to "live vicariously" through her blog for a while when she was on confinement. I told Serene that if not for my blog, I wouldn't have met these wonderful group of people whom I could share my joys and woes with and my son wouldn't have gotten that many playmates. Too bad she didn't have that on print! yeah, it's kinda fun. I was also curious to see who are the other featured mom bloggers were. more people are going to be popping over here! and you ladies look good lah... don't worry! yah, i read, and then i was like... eh. apart from meng choo, i have all these mummies on my LJ and I am single! wtf? but heh, kidding lah, you know i enjoy ur company! and u know i enjoy urs too! let's have dinner again soon! yah..i just have to ensure he doesn't behave like a diva hehe! how are you woman!? you know, i kinda miss having u ard even tho i wasn't close to you. your absence esp during our pdb meeting is kinda obvious..
i actually gave to serene another link..the S'pore blogging moms & dads. Even more moms there. But i guess by then she already got her quota of blogging moms. you mums are so cool! i hope my mum brings back a copy of the papers so that i can read all about it. 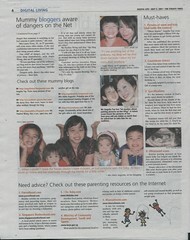 Very cool piece on blogging mommies! I like the part when you mentioned it's embarrassing when you mention how you know 'this group of friends'. My non-blogging mommy friends cannot understand that LOL! I'm glad I got to know YOU through blogging! I grab to put on mine can? can can! you can click on the pics to get the bigger versions or go to my flickr site to grab! 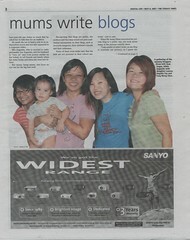 When I saw the words "mothers" and "blogging" on the front page...I was wondering how come you were not featured. 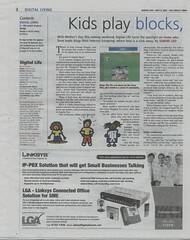 Then I flipped open the papers and *tadah*. Nice pic! Btw, how's the Nikon D40? Good? Am torn between buying the D40 and the Canon EOS 400. Headache. I'm biased lah..have always preferred Nikon. i think the D40 is perfect for a beginner like me. you could also consider the Nikon D40x. Higher resolution but slower sync speed and slower default ISO compared to the D40. But i tried out Jean's Canon EOS! Not that much bulkier than my D40..pics turn out beautiful too..better kit lenses but more expensive than the D40s! heh, so ur colleagues know u blog too? I think it's great that they showcase mommyhood in a different light. yeah, and I was thinking that at least the piece is quite positive..because most of the time, write-ups on bloggers tend to be more negative. I like the photos taken of Aidan! CUte expressions and moments captured ! Good skills + good camera! May I know what camera are you using? but i have to admit, some of my pics are photoshopped...not very much..just using curves and slight contrast and a bit of cloning at times when there's oily faces.